Bluetooth connectivity and rechargeable battery. 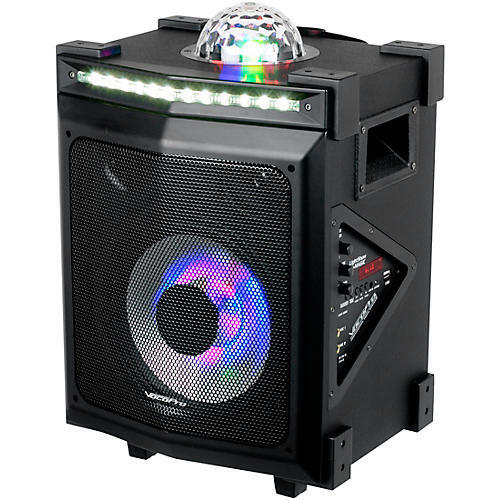 The VocoPro LightShow Magic is an all-in-one karaoke system that will electrify your next party. It features a built-in, sound-activated LED lighting effects to enhance any vocal performance. Set the perfect mood with the LED moonflower, or crank up the energy level with the onboard strobe light. Even the LightShow Magic’s woofer boasts RGB lighting. Karaoke night will never be the same, thanks to the LightShow Magic’s dynamic visual display. The VocoPro LightShow Magic has no shortage of input options. Bluetooth technology lets you stream your favorite songs wirelessly from any Bluetooth-enabled device, including smartphones, iOS devices and laptops. You can also connect directly to the LightShow Magic using its USB input. There’s even a built-in FM radio. Perform pitch-perfect duets thanks to dual microphone inputs with echo effects. Your next karaoke party doesn’t have to depend on power outlets. The VocoPro LightShow has a built-in rechargeable battery for fun off the grid. Take your karaoke party wherever you want—even outdoors. Light up your next karaoke party—order today.